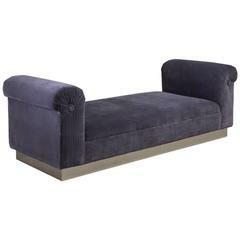 You may have noticed we quite drastically lowered our listed prices for our sofa’s and daybeds. We are thrilled to announce we recently opened our PT-lab (see photos). This means we no longer have to outsource the welding of the brass rods. Hence the price-cut. Enjoy! Model: PT78 lounge bed Frame: Reclaimed hardwood Frame finish: Natural oiled Structure: Extruded and hand-welded solid brass rods Structure finish: Brass golden sand Seat material: Quick dry foam Upholstery: Mattress - Suniture fabrics, canvas spa Upholstery: Cushion - Suniture fabrics, spectrum mist Dimensions: 220 x 214 x 38 cm (w x d x h) 86.6 x 84.25 x 15 inch This is a creation based on our Sit-Stirring collection, designed by Belgian designers Pieter Compernol and Stephanie Grusenmeyer, founders of P.Tendercool, and French designer Jerome Barrier. Our humble homage to Bauhaus, Mies Van Der Rohe & Le Corbusier. This lazy lounger is a prime example of our P. Tendercool bespoke service: a client in the South of France challenged us to turn our sofa design in a larger-than-life lounge bed to be abused next to his POOL. With a whopping 220 x 214 cm this mother is even larger than most King Beds! Order yours with a 1 month lead-time. Send us your preferred Fabric or let us help you to select. Outdoor-cover is optional General info - P. TendercoolsSit-Stirring collection - General info Handmade, bespoke sofa’s and daybeds, for indoor or outdoor use, created with reclaimed teak wood and brass frames. Available to your order Sit stirring A sleek seating collection of 21st century vintage. While our slogan, “we make tables, and we make them well,” honors us with an ever-expanding international fan-base, we felt we really should apply our expertise to a wider field: enter bespoke handmade sofas and daybeds. Crafted with P.Tendercool care, reclaimed Wood, solid Brass and luxurious Latex. Dressed in your preferred Fabrics. Bespoke From Bauhaus to Neuhaus Belgian designers Pieter Compernol and Stephanie Grusenmeyer, founders of P.Tendercool, joined with French designer Jerôme Barrier to create their PT70-series: a humble homage to Bauhaus, Mies Van Der Rohe & Le Corbusier. Yep! We stole from Mies We use cross-profiled extruded solid Brass rods for the legs, arm- and Head-rests of our Sit-Stirring collection. We got the IDEA whilst visiting the iconic Barcelona Pavillion by Mies van der Rohe, one of our all-time favorites. Mies used this shape as supporting column. The cross-profile is not only extremely strong: by - seemingly - straightforward cutting and welding we can create shapes which are elegant, functional and minimal. A leg supports the frame, curls around it, becomes armrest or headrest, curves back to become a leg on the other side. Pure, functional design. Simplicity. Luxurious space With condo prices rising and Location, Location, Location ever more the mantra of city life, “Space” becomes a rare luxury. Our grandest PT70 3-pax sofa takes up a mere 220 x 80.6 x 68 cm / 86.6 x 31.7 x 26.7 inch, AND doubles as a very comfortable guest-bed in seconds, just remove the pillows and bolsters and a perfect, 100% latex mattress awaits your guests, no folding, no need to move furniture. Minimal space taken, no compromise on comfort & flexibility. Elegant. Bespoke. Luxury. Architecture The all-visible architecture of our collection provides stability and functionality, yet delivers linear, luxurious looks. What you see is what you get. From all sides. Even from the back. More and more we combine living, eating, relaxing in one loft-like space, the traditional living rooms are moving on, which means more often than not sofas are placed IN the rooms rather than against walls. Hope you agree most are outright ugly when seen from the back! Very few sofas grace the center of a living room. We believe Ours do. We kept the back low enough not to block your city or Ocean views and No Bulky Blob shapes! Reclaimed wood P.Tendercool is based in Thailand, ideally placed for some serious wood hunting and gathering. We regularly go on sourcing-trips to villages and wood shops where merchants buy up vintage houses, rice-barns and long forgotten structures. While Thailand no longer produces wood, a couple of generations back Teak wood was abundant. It is our job to score this beautifully aged wood and re-use it for our furniture. Real Reclaimed wood, (not the sandblasted machined crap many claim is “reclaimed”). Which means you will find some traces of the wood’s past life: traces of old joints, some pegs- or nail holes we filled, some repairs to the wood…our sofas are strong and sturdy, but they are not perfect. Just like we like. Latex We were blown away when matress-masters Theptex Thailand agreed to help us to soften our Sit-Stirring seating collection: we are humbled, and proud to announce our seats and bolsters are created with the purest, most natural latex, from real trees, from properly managed plantations, harvested by real people, created and processed by skilled workers in Lab-like environments. More mattress-memory than even the best Memory Foam, antibacterial, antimicrobial, anti-fungal, hypo-allergic are just a few perks you’ll enjoy. Most importantly: our sofa's sit Pretty Darn Well. Binge watching House of Cards? Rest assured: Luxurious Latex, always a safe bed. One down-side: reasonable risk of couch-potato-guests overstaying their welcome. Feathers All our pillows and cushions are filled to the brim with down and feathers or latex-flakes should you be allergic. Let us know which you’d prefer Bespoke You found this little Boutique which sells the most amazing fabrics? Just buy & send to us, we'll dress your sofa. Love Jim Thomson? Pass us the codes, we'll arrange. Need a special sized sofa? Contact us. 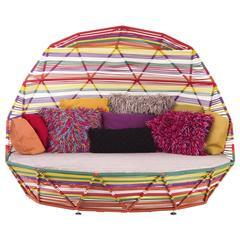 The great outdoors Our sofa’s, daybeds and loungers can be perfectly used outdoors. We then change the Latex with quick-dry foam and upholster with any outdoor fabric you send our way. 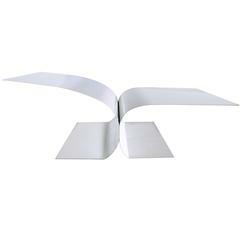 We do recommend to order covers to go with your outdoor furniture. Combine with Our Sofa’s and Daybeds are designed to match our BLTs, our Bronze Low Table collection. Check models PT5, PT6, PT7, PT8 and PT9 Lead-time 1 month We typically need 1 month to create for you, (this is if your fabric is in stock). Global shipping We can request a specific quote within 3 working days Advise the quantity and specific model(s) you prefer: PT70, PT71, PT75, PT76, PT78 . Inform us about your preferred finishes and materials, our delivery address and indicate your preferred delivery means: Door-To-Port or Door-to-Door? Should you like to arrange your own shipping let us know and we will share the crated dimensions and weight. . Crating rest assured. Your treasures will safely arrive on your doorstep. Inquire about our crate-quote and relax: each creation is perfectly packed and crated in custom-made wooden crates. We will send photos during and after packing. We have been shipping worldwide since 2009 and never, ever, had any complaint, reason why we suggest our clients not to bother with insurance, but this is your call eventually: In our experience as former antiques-dealers, insurance company charge a premium and turn in Kafkaesque red-taped bureaucrats whenever a claim is filed… Important notes Brass frames P.Tendercool sofa and daybed frames are made with extruded brass rods and are 100% cut, welded, cleaned, brushed &finished by Hand. Which means they will never be machine-perfect and show our hands: Some edges will be a bit rounded or very slightly out of angle. With the quick-dry mattrass and outdoor fabrics our seating collection can be used outdoors but be aware that Brass oxidizes: although we apply a protective, maintenance-free primer-coating, minor discoloration over time will occur. Antique dealers call this ‘Patina’. This ‘patination’ phenomenon is perfectly normal, inevitable and intentional. Since we use reclaimed wood from Vintage Thai houses, the wood may show traces of restoration, some holes might be filled in (from old wooden pegs), or other marks from the wood's past, which in our view add a unique character to each item we create. Daybed from 1960s. White lacquered iron structure. Waterproof pillow. Size: 180 x 60 cm. Ideal to stay outside in garden or inside in a winter garden.